According to the latest poll (with March data) published by BCG-Excélsior, the PRI has an advantage of 13 over the PAN in electoral preferences toward the 2015 midterm elections. the PRI has 36%, followed by the PAN with 22%, PRD with 15%, PVEM with 8%, MORENA with 7%, MC and PANAL with 3%, and the rest with 2%. According to the poll, only 40% of the survey respondents are totally or highly interested in this elections whereas 21% is not very interested. Furthermore, 41% is not identified with any political party. 1. It seems that the approval rate has stalled at its lowest level and is not going to go lower, at least judging by the changes from previous figures. The approval is 39% for citizens and it drops to 17% for leaders. 2. The perception of Mexico’s problems varies between leaders and civil society. For the former, corruption is the main problem of the country, for the latter, crime is the main problem. 3. Finally, the way economic issues are handled is what is most disapproved of by both groups, while health, education, and poverty are handled the best, according to citizens; and health and employment according to leaders. 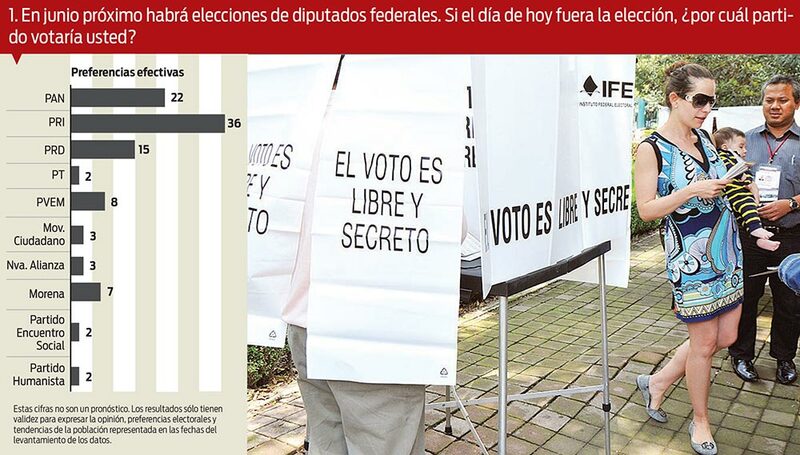 In contrast with the low approval rates for the President, on a new pollster published on March 30 regarding voting intentions for federal deputies, Reforma locates PRI with an effective rate of 32%, PAN 22%, PRD 14%, MORENA 8%, PVEM 7%, ES (Social Encounter) 4%, PANAL 4%, MC 3%, and PT, PH, and independent candidates with 2%. These results represent a rise for PRI and PRD and a decrease for MORENA, PVEM, and PAN, in comparison to the prior poll. Similarly, there is a surprising 4% for both the new ES party and the PANAL. These results potentially indicate that the PRI is surpassing the low approval of the President and that the opposition parties have failed to capture that discontent for the Executive branch, with the exception of some small and new parties. Furthermore, it may also mean that some social issues, such as Ayotzinapa or local-level scandals of corruption, have not made a significant change in the mind of the voter. All these numbers are before the formal start of campaigns next Sunday, April 5. 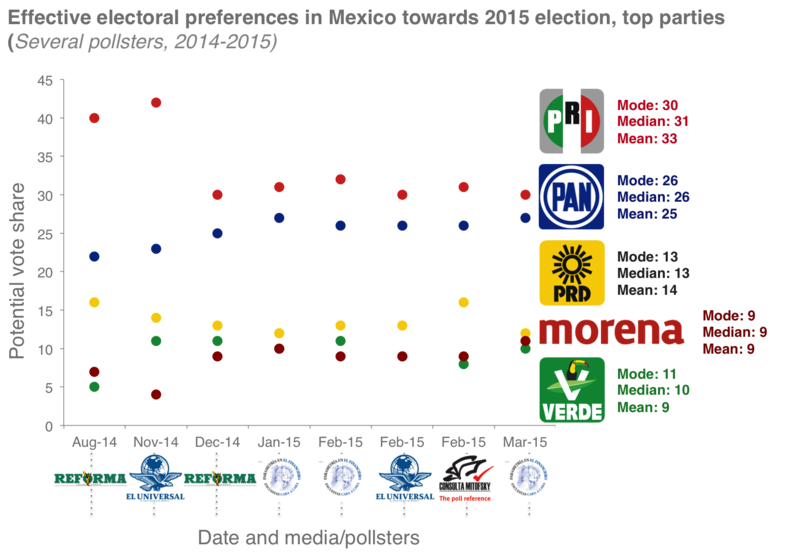 Preferences for the PRI have declined between 10 and 12 percentage points (see Reforma, and El Universal-Buendía and Laredo). This could be a result of several protests and scandals that have affected the Federal government and have clouded the political landscape of the party in power. Still, the party continues to lead the race with around 31% of the potential vote share. 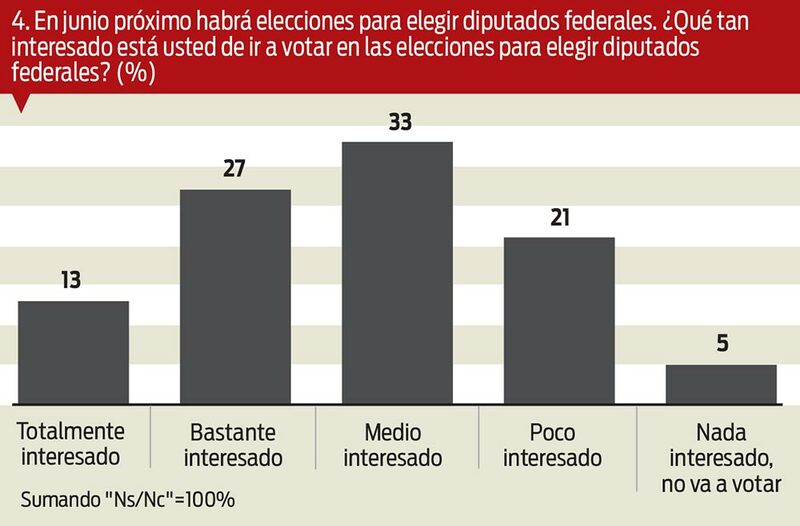 Preferences for the PAN have increased modestly between 1 and 3 percentage points (see Reforma,El Universal-Buendía and Laredo, and El Financiero-Parametría). The party is consolidated as the second electoral option with a median of 26% of the potential vote share. Preferences for the PRD have remained relatively stable, down by 2 points according to Reforma but around 13% of the potential vote share. It is clear that, from an electoral standpoint, the main challenge for the PRD is to maintain its position as the largest leftist party, whose votes are compromised with MORENA, the party formed by Andrés Manuel López Obrador. 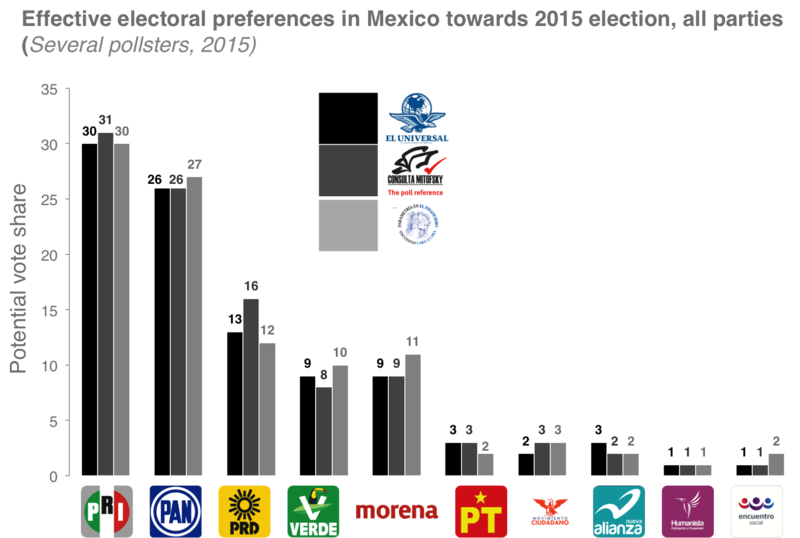 Following the previous point, the numbers reinforce the idea that the vote share of the left in Mexico will be fragmented, on one side with the PRD and on the other side with MORENA. This last party is shaping up to be one of the first ones in the Mexican electoral history to have no problem reaching the 3% threshold required to keep the national registry, and, according to all polls, is even fighting tooth and nail to become the third or fourth political force. According to surveys, MORENA alone would reach around 9% of the potential vote share. The PVEM or Partido Verde Ecologista de México, lies a solid 10% in the polls, which puts it in direct competition with both MORENA and slightly behind the PRD to fight for the third position. Firstly, The PT or Partido del Trabajo concentrates another 3% that would tentatively be also from left-minded voters. Secondly, MC or Movimiento Ciudadano could reach another 3%, although it is not clear that those votes only represent leftist voters. Finally, the polls show about 2.5% for the PANAL or Partido Nueva Alianza and 1% for other new parties (Partido Humanista and Encuentro Social). In the first case, it is possible that the PANAL may keep its registry through alliances and in the second case, it is less likely that those new parties would be able to reach the required threshold. In conclusion, the fight for Congress will be competitive; no party is shaping itself to have a relative majority. Alliances will become key, both to fight for specific districts, but also to vote once the new legislature is in place. Parties like the PVEM and PANAL have the opportunity to ally with the major parties and advance their agendas. On the other hand, the PRD and MORENA are competing to be the biggest party of the left in Mexico and the epicenter of that fight will be Mexico City, where the local congress and municipalities also change in this election. Apparently, PT and MC will keep their registry and the other smaller parties will lose it. Finally, the PAN has the challenge of becoming more competitive and fight for first place in preferences, which the PRI still has.